Griëtte always strives to make her students’ learning experiences as immersive, fun, and interesting as possible. Being a visual learner herself, who enjoyed lots of experiential learning during her BS and MS in the Netherlands, she strongly believes education should accommodate a variety of learning styles. Griëtte has a robust theoretical background in learning psychology and pedagogy, and loves teaching in all forms and at all levels. As the instructor of record of a CU Boulder Summer Primate Behavior course, she partially flips the classroom, by adopting a system of at home readings and associated online assessments. In the classroom and beyond, she uses the freed up time for interactive lectures, student-led expert discussion groups using mind maps, integration of audio-visual materials, and a “primate behavioral research & ethics of primates in captivity” excursion at Denver Zoo. As a UTSA teaching fellow she helped design a new freshmen course (“Academic Inquiry and Scholarship”), trained new teaching assistants, and evaluated courses across the university. Griëtte has furthermore been a teaching assistant and/or coordinator for cultural anthropology, biological anthropology, general biology, and ecology courses. Her favorite teaching setting is the great outdoors. As a scout leader she took this to heart in the Netherlands (and beyond), as a primate zookeeper and research assistant she enriched the experiences and learning moments of others with free-ranging primates, and as a tree climbing facilitator and instructor she has been practicing this in Colorado. Griëtte is a primatologist, forest ecologist, and canopy scientist. She has conducted research in Bolivia (forest ecology), Argentina (owl monkey behavior), and Uganda (primate sensory ecology). Her dissertation work focuses on understanding primate ecology & behavior, and primate community structure, from the “bottom up” by focusing on functional (allowing tree establishment) and trophic effect (e.g., affecting primate behavior) traits present in the tree community. Main traits of interest are the nutrients and secondary compounds (“toxins”) of fruits and leaves – all of which can be found in the forest canopy. She currently works on integrating “drone remote sensing” with phenology measurements, vegetation surveys, and trait measurements to better understand the presence and effects of these traits in primate home ranges. Primate feeding records allow her to integrate this tree community-level information with primate behavior. Phylogenetic analyses subsequently shed light on the order or disorder of connections between primate (species) and tree traits and species. Her ultimate “science wish” is to make primatology more productive by focusing on lines of investigation (functional ecology, phylogeny) that can subsequently be predictively used in primate conservation projects or forest management plans. Tree Climbing Experience Griëtte was trained in Canopy Access Techniques by the late Joe Maher, at ITEC in 2013. She subsequently spent some time climbing in Georgia with both Joe and Bill Maher, as well as Adam Clause (current herpetology instructor at ITEC). In 2014, she spent three months at Kibale National Park, Uganda, where she mostly climbed different individuals of Ficus spp. to gather fruits consumed by grey-cheeked mangabeys (Lophocebus albigena) and redtail monkeys (Cercopithecus ascanius). For more information, read Griëtte’s blog post: Climbing in Uganda. In 2015, she started working with Tree Climbing Colorado. She obtained her facilitator’s certificate in 2016, and facilitates group and festival climbs in the greater Denver area on a regular basis. She co-teaches SRT (single, or static, rope techniques) and DdRT (doubled, or dynamic, rope techniques) courses with Tree Climbing Colorado. Griëtte regularly spreads the word about the importance of canopy science and relevant canopy access techniques at international conferences and in college classrooms. 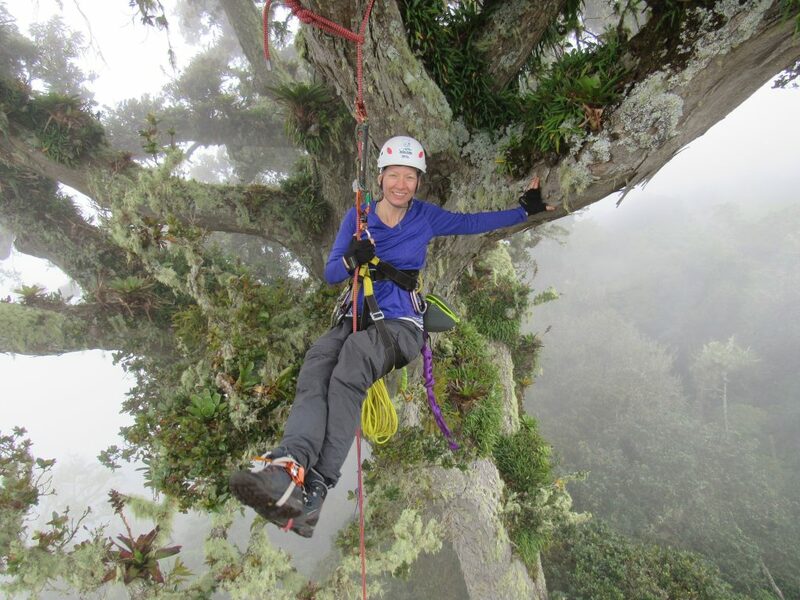 She also serves as a council member for the Global Organization of Tree Climbers (GOTC). For fun, she frequently climbs in broadleaved and coniferous trees in Boulder and surroundings, as well as places such as California and Costa Rica. After the ITEC course, she will spend 6 months in Argentina climbing trees, and instructing research collaborators and Argentinean students in canopy access techniques. This course is designed to provide students with the methodology and expertise necessary to explore and conduct research in the tropical (or temperate) forest canopy. The course involves a hands-on approach to the techniques necessary for accessing the canopy as well as lectures on various topics related to climbing techniques, tree climbing gear, safety while climbing, facilitation of climbing activities, and combining scientific research with climbing. This course is the equivalent of the GOTC recognized Basic Tree Climbing Course (BTCC), a Single Rope Techniques course (SRT), and a Beyond the Basics Canopy Access Techniques course (BBCAT). Upon successful completion of all components of a course, you will be awarded the associated course certificate. In addition, to build a stronger basis, you will receive extra instruction on rescue techniques, and initial instruction on facilitating climbs. Per GOTC guidelines, a facilitator’s certificate cannot be awarded until after sufficient climbing experience has been obtained and documented. If you are interested in becoming a certified Facilitator, you are welcome to discuss the details of the remaining requirements with the instructor. The first day(s) of the course consist of a general orientation, an “introduction to tree climbing” lecture, and an instructor-facilitated introductory climb. There will be a debriefing after this climb, and all subsequent climbs. You are expected to keep a log of all your tree climbs. After this, we will move on to the requirements of the BTCC. We will discuss details of basic DdRT (doubled rope techniques) equipment, tricks to climb safely under different research circumstances, basic tree access methods, basic DdRT climbing, and switch-over techniques. This will take approximately 2-3 days. After fulfilling all the requirements for the BTCC, we will move on to learning basic SRT techniques. We will again discuss relevant equipment, additional safety information, different entry and line setting methods, and basic SRT climbing techniques. These techniques will include: ascending and descending using the YoYo system, the Texas system (plus variations thereof), the frog system, SRT to DdRT switch-overs, and descending using back-up/other devices. This will take approximately 2 days. For approximately four days, we will dive into the techniques that make climbing in the tropics easier, faster, and more flexible. You will learn another way to set your initial line, how to redirect ropes, how to limb walk, and more expert switch-over (DdRT) and SRT (rope walking) techniques. During this time the instructor will encourage the students to experiment with the various techniques, especially with their future research or other endeavors in mind, to discover which methods they like the most. As always, we will focus on safety, and discuss solutions to common and not so common problems one may encounter. We will conduct at least one climb at nighttime, and students will be asked to practice basic techniques (including tying knots) while blindfolded. On day 10, each student will select a tree of their choice, use appropriate entry methods, ascend a tree, do switchovers, and descend a tree, while demonstrating knowledge of and applying safety techniques. This will take approximately 4 days. During the middle of the course, all classes will take a trip to Boquete, and the cloud forest near Boquete. Several general activities are offered, as well as an optional tree climb in the cloud forest. This is a great opportunity to keep improving your tree climbing skills. If needed, we will use a day or two to finish the BBCAT course. During the remainder of the course, we will spend approximately two days on the fundamentals of facilitating climbs. We will also spend approximately two days on additional rescue techniques and risk management. Students will furthermore take the lead in team climbing, and we may spend some time on climbing smaller, branchless, trees. Each student will also be asked to conduct one day of “mock” research – an activity similar to the student’s envisioned research. The idea is that the student will go through all the motions of doing a day’s work of research, including gaining access to the tree. Students can help each other fulfill this requirement (e.g., as “research assistants”). During one of the last days, students can opt to facilitate a group climb with new climbers. The remainder of the time will be spend on climbing trees of different species and physiognomy, and increasing confidence. Students are expected to attend all climbs, lectures, and debriefings. This includes night climbs, rescue techniques training, and facilitator training. Students are also expected to clean up and organize climbing gear after each climb. To finish the BTCC, SRT, and BBCAT course, students will be asked to complete an exam, and go through a skills check-off list with the instructor. Students are encouraged to take a facilitator’s exam as well. From the beginning, students will complete climbing logs. In case of illness, and other unexpected circumstances, the instructor will try her best to accommodate a repeat of missed activities – but only if time permits. All students fulfilling the requirements of the BTCC, SRT, BBCAT, and learning the main rescue techniques, takes precedence over anything else. The instructor will demonstrate other books at the station, and recommend further readings. In addition to “ITEC-required” equipment, several other pieces of gear are needed for the canopy access techniques course. Headlamp (e.g., Petzl or Black Diamond). If your headlamp is old, you may consider purchasing an extra bulb. Batteries can be purchased in Panama. A buff, or something similar (plus plenty of hair ties). A buff fits nicely underneath a helmet, and will keep sweat and hairs away from gear. Gloves used for weight-lifting, or gardening type gloves. A pair of sunglasses that cover the eyes well (and do not easily fall off) and/or a pair of safety glasses. ITEC, and your instructor, require you to wear a helmet. If you wish to bring your own helmet, you may do so. Simple rock climbing helmets (like the Petzl Elios) work well for tree climbing. More specialized tree climbing helmets exist as well (please ask the instructor for more information). If you are purchasing one, please try them on in the store, since sizing can be different between models and the same model in different years. ITEC will have all the climbing gear you need during the course. Accessory items, like chalk bags (without the chalk), are always good to bring. Serious climbing gear (e.g., harness) can be brought along, but it is better to contact the instructor first to check if the gear is appropriate for tree climbing. Your water bottle should (preferably) be attachable to a carabiner. TIP: Outdoor pants with a (relatively) high waist work better than pants with a low waist. Pants tend to ride down while climbing, and shirts tend to ride up, in the back.